Flower essences embody the wisdom teaching of the plant from which they are made. Working with a Flower essence is akin to spending a quiet day in the company of that plant and drinking in the medicine of its presence and the landscape in which it lives. Flower Essences are water-based homeopathic preparations that contain no scent, flavor, or physical constituents of the plants from which they are made. While they are the most gentle of form of herbal medicine available, they are also the most profound when it comes to bringing healing and wholeness to the human Heart + Spirit. 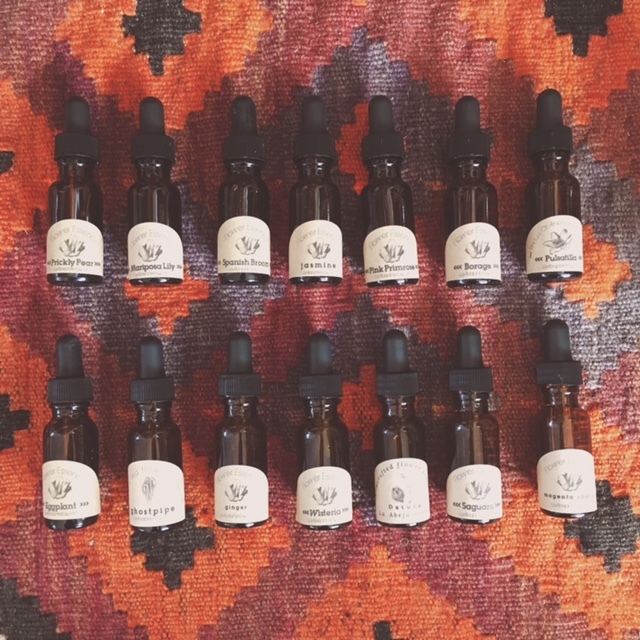 The true magic + medicine of flower essences is difficult to communicate fully until you've tried them yourself -- and we certainly hope you will. Are there many essences that speak to you at once? Want to play around with formulation? Feeling ripe and ready to explore your inner world and embark on a journey of deep transformation? We offer a discount on flower essence collections of different sizes and invite you to choose the essences that are calling to you. Simply pick the collection you'd like and let us know in your notes to seller, which essences you'd like us to include.